Odyssey House Community Health Center is a patient centered medical home providing primary care that is patient-centered, comprehensive, team-based, coordinated, accessible, and focused on quality and safety. It is the mission of the Odyssey House Community Health Center to provide comprehensive primary care services to low-income, high-risk, and underserved individuals regardless of ability to pay. 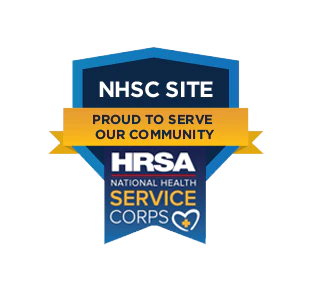 With a focus on integrated physical, behavioral, and dietary healthcare, including wraparound substance abuse treatment and HIV/AIDS services, the Odyssey House Community Health Center offers compassionate care in efforts to improve quality healthcare within the communities we serve. The Odyssey House Community Health Center is open Monday through Friday 8am-5pm. From conducting routine health screenings, to treating acute illnesses, to managing chronic health conditions, the medical staff at the Community Health Center address all areas of general adult healthcare. The Health Center also provides behavioral health services with counseling; medication management; STD screening and treatment; and HIV testing, and supportive services. 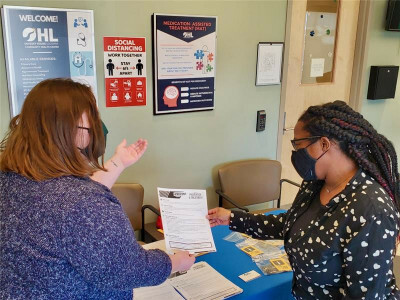 The Health Center also offers consults by a registered dietician, as well as visits with a nurse care manager who can help answer questions on your diagnosis, medications and management plan. Odyssey House Community Health Center is proud to announce its HIV Focus program which is a partnership with Gilead to improve HIV awareness and de-stigmatize HIV by offering all persons seen in the clinic an HIV screening test as part of their annual routine care and as needed based upon risk factors. We offer free walk-in HIV screening every Tuesday from 2-4pm and all other times by appointment. Appointments are available by calling 504-383-8559. 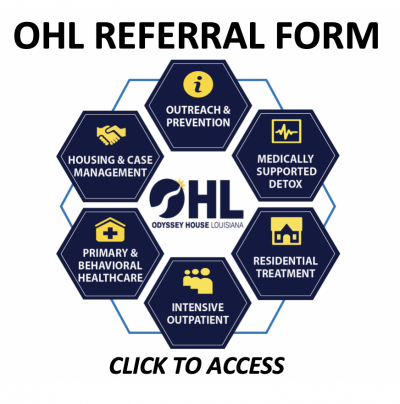 The OHL Community Health Center offers same day and next day appointments. Behavioral Health visits are by appointment only. Services at the Health Center do have nominal charges; however, we are health care professionals who believe that quality healthcare should be an inherent right of all individuals regardless of ability to pay. We take some insurance carriers, Medicaid, Medicare and self pay/sliding fee scale. We are a designated Medicaid Application Center and can assist individuals with applying for Medicaid. Individuals who are uninsured at the time of their visit are eligible to apply for our sliding fee scale discount. Services will be offered to individuals regardless of ability to pay. We also assist individuals in accessing other community healthcare resources. Same and next day appointments available. After-hours calls will go to an on-call provider. Call the same line- (504) 383-8559- after hours. After hours calls will go to an on-call provider. Additionally, if you are a first-time patient, please view the Intake Documents section on this page for downloadable forms you can fill out and bring with you on your first visit.